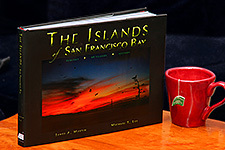 The Chapters in The Islands Book are organized to present some islands on their own, and to present others in association with similar islands. The result is a wealth of information presented by great authors in neat packets. The Islands Book is truly novel - not least because it's the only volume covering all the islands, but also because of the unique design and photographic artistry brought by the individuals who produced it. Down Window Press is what's behind this great volume, and we can promise you haven't seen a book like this. Below is the foreward for the book. The Islands Book became more of a passionate lifestyle than simply a book project. Continual thought and re-evaluation went into how best to present hundreds of remarkable images and fantastic authors in a way that could match the beauty of this Bay. A challenge indeed, and we hope you enjoy the product of that work. Orders are accepted through this site with instant savings. The Islands of San Francisco Bay retails for $55 US in stores. to purchase books at a reduced price.